It’s far to easy to underestimate the importance of a quality phono stage – people can often spend significant amounts on a cartridge which, like it or not, will be wearing from day one. Yet they will still feed this signal into either an inbuilt phono stage of limited performance or some low cost step up device. Today the choice is easy - the Dynavector P75 MK3 phono stage. 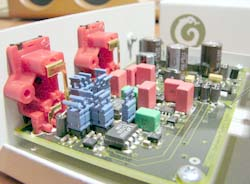 Now in Mark 3 form it's far more sophisticated in every way and right at the cutting edge of phono stage design. This is the one to beat. The Dynavector P75 works on 3 levels. Firstly for either Moving Magnet or high output coil cartridges, it provides the right step up to line level. Low output moving coils are more demanding and the P75Mk3 makes the most of these with a vanishingly low noise floor and exceptional detail retrieval plus the ability to be fine tuned for cartridge loading. Finally for the very best sound – especially the Dynavectors, the Patented Phono Enhancing Circuit designed by Dr Tominari, to dramatically improve the performance of low output moving coil cartridges. The P75 features an advanced on board power supply operating at over 1.4mMHz. It takes the low grade single DC power supply from a standard 12v AC to DC plug-in transformer and converts it into the dual high voltages required for the best possible audio fidelity. The operating frequency is over 12 times higher than the very top of the audio band and it incorporates super low noise, wide bandwidth regulators in its output stage to give ultra-low noise supply rails. The P75Mk3 power supply is totally self contained and stores many times the maximum possible energy requirements for the phono amplifier – all in a box that fits in the palm of your hand and sells for just NZ$ 995! While it is possible to spend much more, we've discovered that the converse of our original mindset makes far more sense - grab a P75Mk3 - then invest what you have saved in as good a quality interconnects and cartridge as you are game to. The end result will be far better than any alternative for the same total spend. If you are trying to stick to a budget below the Dynavector, please, please find a way to get up to this level - you'll be really glad you did. We've listened to many lower cost alternatives and the gulf remains wide. Tonally the MkII shows a slightly wider bandwidth with very good detail, just a hint of treble softness, a smooth, neutral midband, some bass roll-off and reduced impact. In the manner of the best audio components, the MkII extracts a huge amount of detail from the record but presents it in a totally natural way. This naturalness is the main sonic improvement over the MkI, which could on occasion appear a little aloof and mechanical. The MkII is 100% organic, presenting music as it appears in real life, full of natural colour and an engaging immediacy that elicits hours of pleasurable listening... Despite the increased competition, the Dynavector remains a bargain with its superb sound and easy price. Raise the ergonomics to same level as the excellent sonic performance and the little Dynavector would be perfect. As it is, it cements its position as a best buy in sub-$1000 phono stages. Audioenz. The Dynavector makes me want to dance. I was tapping my feet so much while I played some of my blues LPs that my leg muscles got sore. I was blown away by the power that came from my speakers; the sense I was listening to real music, not electronically reproduced music. If you have ever been in a room with any instrument while it is being played, you can sense the sound pressure waves against your body. I don't feel that too often with music. That reality, that presence, is lost through lesser electronics. Of course, a good amount of that feeling comes from the speakers: if they lack the ability to produce that feel, those sounds, you just aren't going to hear it. Of course! But it has to be sent to those speakers from a recording. That recording has to be reproduced properly by all the electronics in the chain—especially the phonostage. The Dyna delivers that feeling. Positve Feedback. The result? Effortless emotional involvement from a sound that just flows into the room. This really highlights what the Dynavector P75 is all about - musical neutrality. I have really enjoyed owning and using the Dynavector P100 stage but the P75 has equalled (and surpassed in some areas) its predecessor's performance for a third the price, a great achievement. I think there is a very real risk that the P75 will be overlooked on grounds of price; it's simply too cheap to appeal to some big-spending audiophiles. But that would be a huge mistake. Buy one of these little beauties and I can guarantee that the CD player will be seeing a lot less action from then on. HiFiPlus. As you might imagine, we don't just talk about the Dynavectors. We always have the P75MK3 in stock and on demonstration along with a good variety of cartridge choices, interconnects and turntables. So call in and see us, phone or e mail and we'll help you take the next step towards the best of analogue sound. John Ransley and Sharon Guytonbeck are the principals behind Totally Wired. It’s our own business and we take pride in building something worthwhile.